Origin: Asia. Pakistan, India, Bangladesh, Myanmar, Thailand, and Malaysia. Company: Other small peaceful fish. 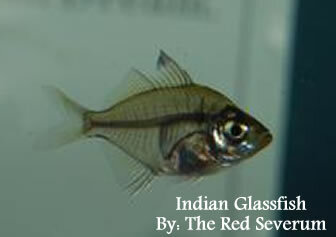 Aquarium setup: Parambassis ranga (Indian Glassfish) can be kept in small aquariums. Decorate aquarium with free areas to swim in the middle and heavily planted areas around the sides. Use rocks to create caves and hiding places. Fish are easier to keep healthy if a small amount of salt is added to the water. Feeding: Accepts most foods including flakes. Breeding: Easy. Raising the temperature and conducting water changes may trigger spawning. Eggs are laid on broad leaved plants. The fry can be hard to raise. Picture of Indian Glassfish - Parambassis ranga.